I don't always wear a helmet when I ride and jump. Should I? Yes I should. However I'm an adult, have no children and now don't even have a significient other. I know it's a risk and am fully aware of the consequences, nuff said. The pic outside was taken a few weeks ago. I was playing around with my automatic release. 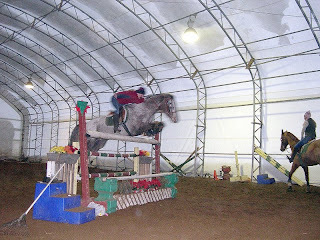 This fence is 3'6"
The other pic above was taken this Chsirtmas at our barn's holiday party high jump competition. I actually had every intention of wearing my helmet this time, had even brought it down to the indoor and simply forgot. 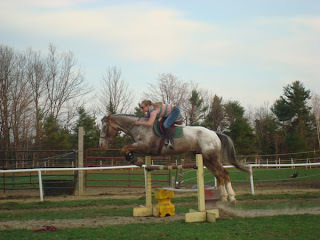 This is our highest jump ever at 4'6", it took my breath away to clear it. My horse is awesome! Wow - a great title and a terrific start. I bet you will find this very therapeutic and an excellent outlet as you work through things. You and your horse are both beautiful and strong, and I know you'll find your way.